Guinea pigs are social creatures and enjoy the company of other guinea pigs. They are thigmotactic, which means they like to cuddle up to others of their kind. Their personalities shine when they have a friend to play with, to chase around the cage, and to cuddle with. A solitary life in a cage alone is not a content life for a social animal. The decision to have guinea pigs as pets should take into account what's best for the guinea pigs, as well as what's best for the owner. Having a single guinea pig as a pet is a decision that benefits only the owner (smaller cage space, less food to buy, fewer vet costs, etc.) 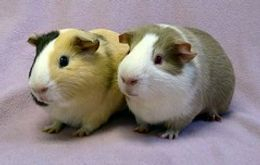 Having a guinea pig pair is a decision that benefits both the owner and the guinea pigs. When guinea pigs are happier, more vocal, and healthier the owner will establish a more meaningful relationship with them. Caring properly for guinea pigs means providing constant companionship for them in the form of a cagemate. All the guinea pigs at our rescue are non-breeding bonded pairs or trios, except for the single guinea pigs who were surrendered to us as individuals. 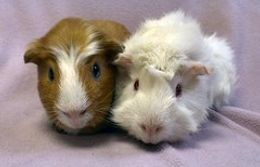 Single guinea pigs are adopted only to those adopters who have a guinea pig at home that needs a friend. While at our rescue, the single guinea pigs still have companionship. All singles are placed next-door to other guinea pigs so they can talk to their neighbors and nose each other through the grids until they find forever homes.